Email is the primary and preferred way to communicate for many people. Whether it is your internal team members, your "customers", or industry partners, most people communicated via email. The messages you exchanged often contain valuable information that you want to record in your CRM/xRM system. 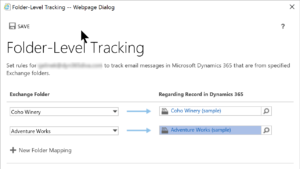 Fortunately, there are multiple options for tracking emails messages in your Dynamics CRM system. Let's take a high-level look at those options. 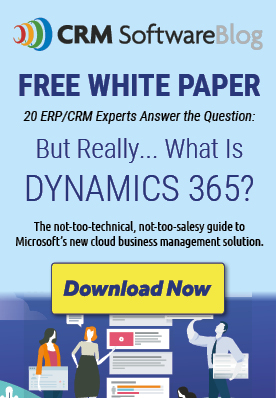 The Microsoft Dynamics 365 for Outlook application has been around a long time. It is an add-in that you download and install that works within your Microsoft Outlook client. You will see in integrated experience with CRM and Outlook on the ribbon, in your file tab and in your navigation pane. With this client, you can browse CRM records, track Emails, Contacts, Tasks and Appointments. 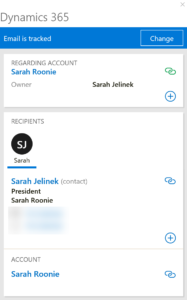 The App for Outlook is quickly becoming the successor and replacement for the Microsoft Dynamics 365 (CRM) for Outlook add-in. This was introduced with Dynamics CRM 2016 and does not require any installation by the end user. - You will need to enable the App for Outlook for the user and ensure he/she has appropriate privileges via Security Roles to utilize the app. If you have an organized mailbox (or ambitions to have an organized mailbox) you will love Folder Level Tracking. You can organize your emails into separate folders and configure CRM to automatically track the emails placed in those folders. Would you like to see these three features in action? Join us for our FREE webinar on Thursday, March 30th, 2017at 2:00 pm EDT. We'll demonstrate each option with examples that will help you see the good and the even better when it comes to tracking emails. If you are unable to attend our free webinar on March 30th, you can view the recording of the webinar and our other webinars at http://arcticit.com/category/webinars/. By Sarah Jelinek, Arctic IT Senior Developer and CRM/Business Applications Trainer. Contact Sarah at [email protected] or catch her on Twitter at @Dyn365Diva. We have CRM 2016 On Premise and Exchange on-site – will all the options discussed in this article apply to us without requiring any new version of the software or cloud account setup.